The 2018 Land Rover Discovery is an amazing combination of luxury, efficiency, technology-forward features, and stylish qualities. 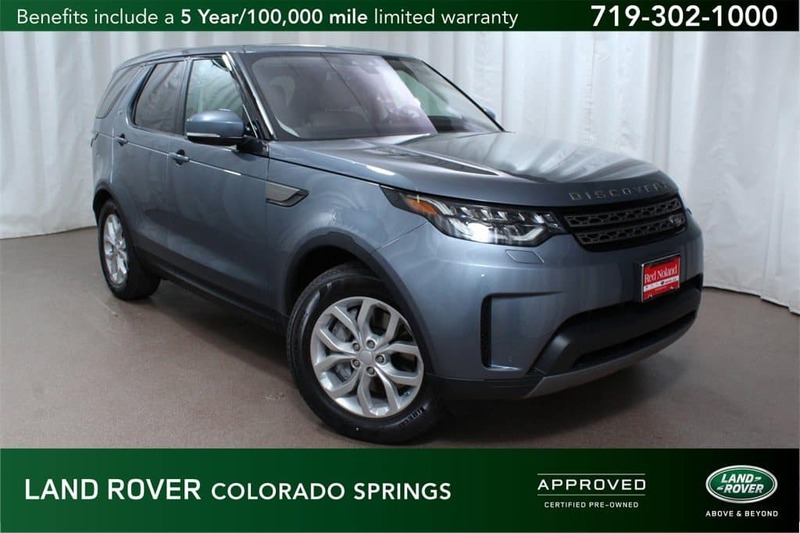 Here at Land Rover Colorado Springs we have a great inventory of Certified PreOwned vehicles that will fit many budgets, needs, and wants in terms of exterior/interior color combinations, features equipped, and fuel efficiency standards. One of the currently available CPO 2018 Land Rover Discovery SUVs in our inventory is the one pictured above. With a glossy Byron Blue exterior color and a beautiful combination of acorn, ebony, and light oyster colors for the interior, you are looking at one beautifully designed and equipped SUV. Equipped with a V6 supercharged engine and paired with a ZF 8-speed automatic transmission, you are looking at getting an estimated 16 MPG city/21 MPG highway fuel economy. Plus, this SUV only has 9,000 miles on it so that means it still has lots of drive time left to enjoy! Being a previous part of our service loaner fleet, we can promise you that the conditioning process of this specific Land Rover was a breeze. You won’t be disappointed with the number of features you can look forward to in this SUV because it is loaded! A 7-seat package, heated windshield wiper jets, and driver condition monitoring are just some of the features you can appreciate! Your Land Rover enhanced sound system has 10-speakers so you can enjoy your favorite music. Plus, you’ll have access to a power liftgate, heated power side mirrors, and 12-way power front seats. These are just some of the great features in this 2018 Land Rover Discovery! Being a Certified Pre-Owned vehicle, you’ll get some great added benefits which include a 5-year/100,000-mile limited warranty, 24-hour roadside assistance, and a vehicle history report. Visit Land Rover Colorado Springs for a test drive of this luxury performance SUV!